Update June 12, 2017: Intel have just announced at their first ever E3 press conference the X-series processors will be up for pre-order starting next week. A great CPU needs a good GPU too. Check out our pick of the best graphics cards of today. Gregory Bryant, Intel’s head of PC gubbins, said the first Core i7 X-series chips and the 10-core Core i9 will be available next week, with pre-orders for the ‘mega-tasking’ (bleurgh) 12-, 14-, 16- and 18-core processors also kicking off at the same time. 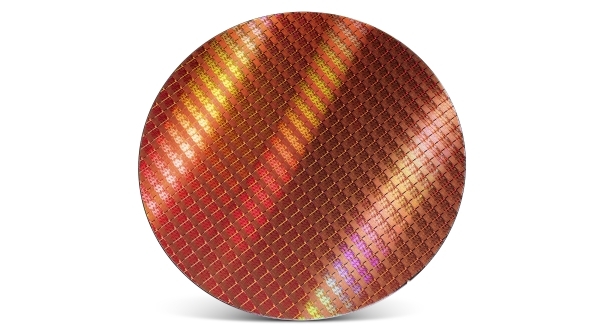 While the more mainstream, though still pricey, CPUs will be on sale in June, the big chips will be hitting the retailers from August through to October this year. You know, should you want to drop $2,000 on a CPU. Intel did though show the first live demo of the 18-core, 16-thread Core i9 7980XE processor running an intensive VR-gaming, streaming and green-screen rendering workload spitting out to Twitch. Original story June 7, 2017: Intel have officially unveiled their new Core X CPUs, covering both the Skylake-X and Kaby Lake-X chips. The big news? Well, there’s a $2K 36-thread monster chip and a further four super-expensive +$999 processors coming soon too. Skylake-X is the next big CPU release from Intel and is the first real reaction to AMD’s Ryzen we’ve seen from the big chip maker. WithRyzen Threadrippercoming in August/September this year, Intel have made sure to get their mega-core processors in early. This is Intel’s serious high-end desktop (HEDT) CPU platform for the ultra-enthusiast gamer -the people with multiple graphics cards and hefty bank accounts. The new chips have been created for heavy-duty productivity folk too, the sort who need a lot of processing power for video work or 3D rendering, for example. This is a segment AMD is eating into with Ryzen and Intel are fighting back. 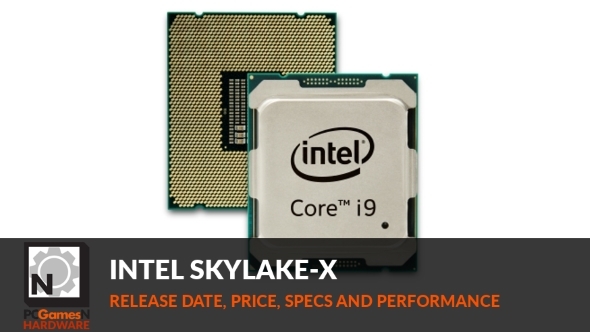 At its heart, Skylake-X is the 14nm refresh of the existing Broadwell-E range of high-end Intel processors, which should mean it offers higher clockspeeds and greater energy efficiency too. Alongside Skylake-X will also come the smaller-scale Kaby Lake-X chips, supporting their bigger siblings with lower-spec processors, forming a bridge on the X299 platform between them and current Kaby Lake range on the Z270 chipset. Originally, Skylake-X and Kaby Lake-X were penned for an August release, with many of us picking either an Intel Developer Forum or Gamescom launch for their new range. That’s been thrown out of the window with both the cancellation of Intel’s big tech conference and AMD designing their own separate high-end platform to sit above their current Ryzen range. AMD’s Threadripper is likely to launch around August/September this year, and so Intel have reportedly brought the release for Skylake-X and Kaby Lake-X forward to June in order to throw the first punch in this new battle for high-end CPU supremacy. We heard more about Intel’s new HEDT platform at Computex in Taiwan, with Intel unveiling the pricing for the entire stack of 4 to 18 core Core X processors. We’re expecting a full launch at the end of June with the initial chips available likely to top out at 10 cores and the 12-18 core CPUs likely to follow later in the year. In a bit of a confused release announcement at their first ever E3 press conference, Intel’s Gregory Bryant explained the pre-orders were going live from next week with the Core i7 Kaby Lake-X chips, up to the deca-core Core i9 7900X, being available and the higher core-count CPUs following in August through to October. You can bet it’s that Core i9 7980XE chip, “an 18-core beast of a product that delivers the ultimate in mega-tasking,” according to Bryant, which is going to be the laggardly October release. It’s possible Intel are hanging back with the release of their massively multi-core chips to see what AMD do with their Ryzen Threadripper processors when they’re released later in the summer. Intel’s Core X pricing ranges from the actually-not-absurd to the what-mad-man-would-pay-that ridiculous. Despite not having final specs for the full range Intel have revealed the pricing for the nine different Skylake-X and Kaby Lake-X chips set to launch this year. At the bottom of the list is Intel’s first HEDT Core i5 chip. At $242 the Kaby Lake-X i5 is the same price as the Kaby Lake Core i5 7600K, making it a rather affordable processor. It’s the same situation with the other Kaby Lake-X chip, the Core i7 7740X, where it’s set to retail for the same price as the 7700K. The step up to the Skylake-X level is none too steep either with the six-core i9, which replaces the Core i7 6800K, being only another $50 more expensive. With that you also gain access to quad-channel memory and up to 28 PCIe lanes. The 10-core i9 7900X is a lot cheaper than the equivalent CPU of the last generation though, the Core i7 6950X. That’s still retailing for $1,500 while the 7900X will launch at $999. If you want more cores than that though things get pricey real quick, topping out with the 18-core Core i9 7980XE costing $1,999. Yup. Two thousand dollars for a processor that’s meant to be aimed at consumers. Blame AMD, if they hadn’t put the 16-core Threadripper cat amongst Intel’s flappy birds none of this would be happening. Though, yay, AMD. If they hadn’t done that we’d be stuck at 10 cores and 10% performance improvements across the board. 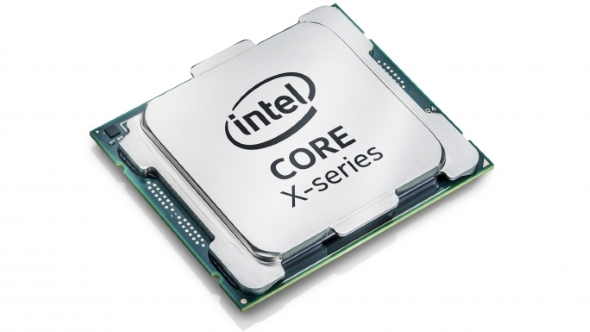 Intel have now announced the full range of their Core X processors, featuring both Skylake-X and Kaby Lake-X silicon. There are nine different chips in total, those five ultra enthusiast Core i9 CPUs as well two Skylake-X powered Core i7 chips, a Kaby Lake-X Core i7 and, for the first time, an enthusiast level Core i5 at the bottom of the lineup. 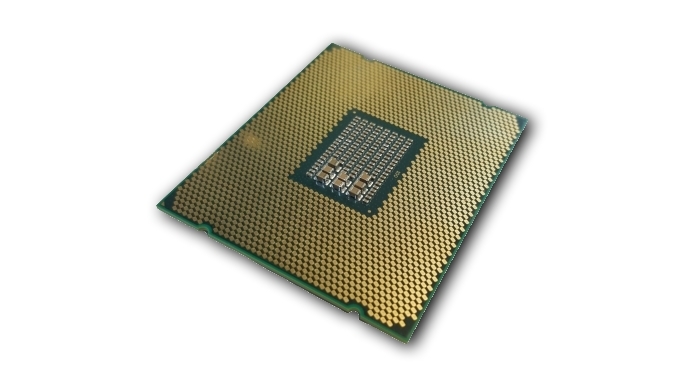 Probably most exciting is the fact the Core i9 7980XE, the 18-core, 36-thread super-chip, is the world’s first Teraflop desktop processor. That’s pretty special. Unfortunately, while Intel announced the top chip at Computex at the end of May, the initial batch of Core X chips will stop at 10 cores. The 12, 14, 16 and 18 core SKUs aren’t going to be released for a long while, so all we’ve got are prices and no real specs beyond their core-count. For the rest we know a lot more, from clockspeed and Turbo, to TDP and memory compatibility and support. It’s actually going to be surprisingly easy to tell the Skylake-X and Kaby Lake-X chips because Intel have introduced a new range of chips. It’s surprising because Intel are usual the masters of obfuscating marketing around their different processors. The new Core i9 range covers everything above the quad-core mark and that also means the Core i9s are the only ones in the new HEDT heirarchy to use quad-channel memory too. That’s the interesting stuff out the way, now for the downright odd stuff. Intel’s Kaby Lake-X variant, ostensibly using the same 14nm CPU architecture, are not going to be able to support the quad-channel DDR4 memory of their CPU siblings, being limited to just dual-channel memory despite dropping into the exact same motherboards. They’re also limited to 16 PCIe lanes too, making them strangers in a strange X299 land. Even more weirdly, Intel are also introducing the Core i5 name into their HEDT for the first time. The Core i5 7640X is a non-HyperThreaded Kaby Lake-X chip, which just has four cores and four threads. That makes it weaker than one of the top standard Kaby Lake chips, but thankfully they’ve priced it at Core i5 levels. These will essentially be bridge chips for people who want to use the new high-end platform, but don’t want to be spending big on a super-expensive multi-core CPU. So if you want to have an expensive high-end motherboard paired up with a processor which almost entirely fails to take advantage of the platform’s major benefits, then the Kaby Lake-X range looks like it’s going to be for you. You freak. In terms of that platform for the new Skylake-X and Kaby Lake-X chips, Intel will be introducing the new X299 chipset, codenamed Basin Falls. This will house a new LGA 2066 socket with, guess what… 2,066 pins inside it to get bent out of shape by an errant thumb. 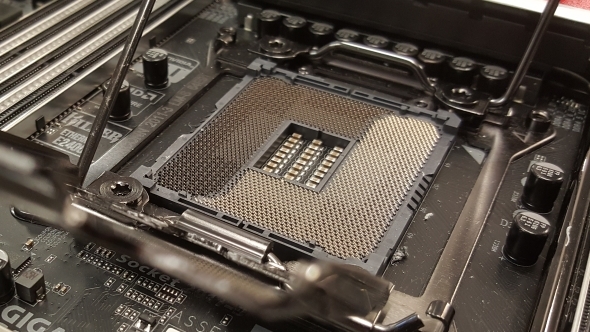 Like the current X99 platform, with its LGA 2011 v3 socket, the X299 boards will all have support for quad-channel DDR4 despite whatever Kaby Lake-X gets up to. There were wall-to-wall X299 motherboards all over the Computex show in Taiwan, so there are going to be a whole host of boards coming from all the usual suspects. We’ve now finally seen Skylake-X running. At Computex the different motherboard vendors were keen to show off their wares and part of that meant we got to see the 10-core Core i9 7900X in action. At the same Asus event where they announced the Coffee LakeZ390 platform – who knows what that’s going to be apart from 20 better than AMD’s X370 – and the potential overclocking performance of Threadripper, they also had Skylake-X in overclocked trim. We saw it hitting 2,364 points in Cinebench R15’s multi-core rendering test while overclocked to 4.3GHz. That is the single-core max Turbo clockspeed, so nothing to get overly excited about in terms of frequency, but that’s still a healthy 22% faster than we managed at peak overclock from our old Core i7 6950X CPU. Intel were touting a 10% performance improvement in multi-threaded tasks compared with the previous generation. So for the 10-core Core i9 7900X (though stillbeing referred to as a Core i7 7900X in CPU-Z) to be easily getting overclocked to run over 22% quicker in Cinebench that’s mighty impressive. 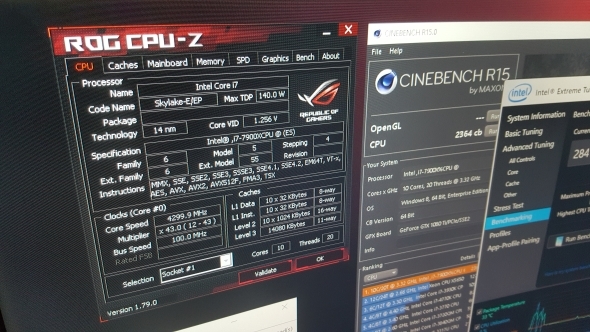 Though sadly Asus did also say the 4.3GHz overclock was pretty much as fast as it would go under normal circumstances. What it would do withliquid helium overclocking? Well, I guess we’ll have to wait and see. Intel are also suggesting an official 15% single-threaded performance boost, which could be significant if they really want to sell it as an enthusiast gaming chip. Maybe the Kaby Lake-X parts will be the serious overclockers and proper gaming chips though as Asus managed to hit 7.5GHz with the i7 7740X at an event around Computex. Okay, so they used liquid helium to get there, but with the extra space for those four cores to rattle around in you’d think they might have more cooling potential and therefore overclocking headroom. The Kaby Lake-X chips are the same physical size, in package terms, as the 18-core CPUs, so there’s going to be a lot of empty space in there for a lowly quad. This might all help keep the Skylake-X range of chips looking relevant in the face of AMD’s Ryzen Threadripper. I don’t think AMD will be able to hit 4GHz+ all-core clockspeeds on their inaugural high-end desktop platform, which means for us serious gamers at least, the Intel side will likely retain their performance edge. It looks like Intel are doing all they can to maximise that because , as well as the high clockspeeds, Intel have upped the TDP on this range of chips from the 140W of Broadwell-E to a reported 175W for the top Skylake-X parts. That will give them more freedom to really go for it with these high-end chips, especially now they’ve got genuine competition for once. And that’s what makes this launch so intriguing, it’s Intel’s first now they’ve got someone to finally work against.